A cozy home is a place of warmth and happiness. In every house, the kitchen is the hub of all home activities – right from cooking meals, eating dinners, cutting and chopping vegetables, doing their homework to having friends over. It all happens in the kitchen. And, to be able to do all of the above, your kitchen needs to be groomed the right way. Homeowners in Mississauga, get their kitchen remodeled for a variety of reasons – to improve its functionality, enhance the available space or to revamp it into a newer looking kitchen. Whatever may be the reason, a well-designed kitchen adds to the overall beauty and functionality of the house. It is like renovating everyone’s most favorite room in the home. Get yourself Mississauga Kitchen Cabinets and give your kitchen a stunning makeover with CozyHome. With this expert in custom kitchen cabinets who work their creativity and design knowledge to make beautiful kitchens, you can finally have the kitchen you have always longed for in your Mississauga home. The Kitchen is the soul of every household and keeping it groomed and fully-functional is a necessity. CozyHome commits its time, expertise and services in assisting homeowners to realize their dream of having a beautiful kitchen. We design your homes with the best quality custom kitchen cabinets and renovation designs at a reasonable price. What have you been wishing for your kitchen? – Is it a kitchen with contemporary styling or a classic traditional setup? The design experts at CozyHome can help you accomplish all your kitchen needs and give you exactly what you want. Consult us today for a free design consultation! Many Mississauga homeowners dread the idea of renovating the kitchen. But, with CozyHome’s systematic process of kitchen remodeling, you won’t have to wait months before the kitchen is all designed and set up. Our team follows a few easy steps and works very hard to make sure our clients have what they want. Right from the first phase of designing to the final delivery of your completed kitchen, the whole process takes anywhere between one to two weeks. Fix your first meeting by booking a free appointment with the design expert at CozyHome. Take your home kitchen’s approximate measures and discuss your design idea with the designer. Then he or she will use their talent, knowledge, and expertise to create the best possible design options for your kitchen explicitly customized for your home. You will get to view this design on 3D, which will give you a better impression of how it will look as a final product. The renovation project quotation and any additional design alterations are both free of charge. A CozyHome technician will get in touch with you after the design meeting and come over to your house to take accurate and final measurements and dimensions of your kitchen. Based on these dimensions, the manufacturing team will start building your custom kitchen cabinets. Our team of expert installers will deliver and install your new kitchen cabinets and accessories, and execute the entire renovation process as promised. The installation takes about one to two days. And, the countertop manufacturing and delivery can take roughly up to two weeks. This one is the best step in the process. You are all set to relax and enjoy your new kitchen renovation as per your dreams and choice. Make the most of your new customized kitchen cabinets. Our ready-to-assemble cabinets are as good as our custom-designed cabinets. You don’t have to compromise on quality while planning your perfect kitchen. Do you want a beautiful design for your kitchen and at an affordable price? You got us! We are all that you have been looking for. Our cabinets have – Solid cabinet doors, drawer fronts and drawers; plywood boxes and shelves; sturdy wood dovetail construction drawers; frameless cabinetry structure; adjustable hinges for all standard cabinets; full extension drawers, with under mount soft-close glides; and a vast variety of kitchen size, capable of fitting in any kitchen size or design. Every Mississauga homeowner has their own preference in kitchen styling. Pick your style for your kitchen – traditional or modern, elegant or simple; we have ample kitchen cabinets designs, which will undoubtedly have something suitable for you. If you are looking for custom kitchen design for your Mississauga home, you should straight opt for CozyHome to design and plan your kitchen renovation. We provide our customers with unparalleled products and services at competitive rates. You can get a kitchen of your dreams without digging a hole in your pocket. You can have your kitchen all remodeled and set up within weeks without having to wait for months. CozyHome offers a gamut of beautiful designs to its customers. 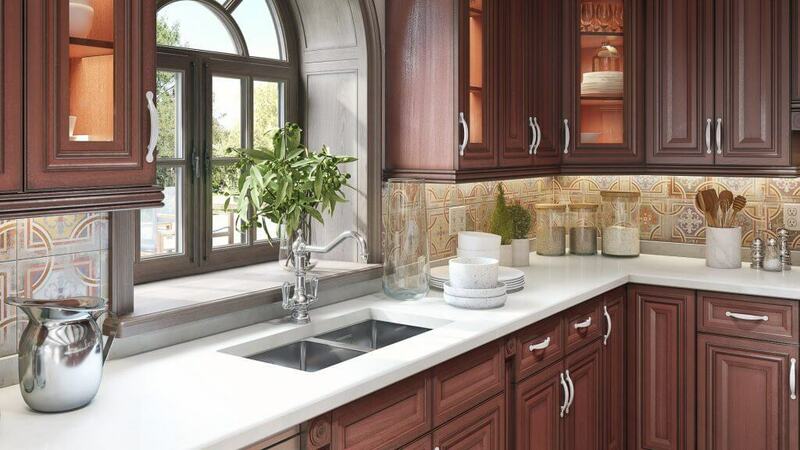 They are experts at designing, creating and installing the best-suited customized kitchen cabinets for each client. Contact us for more information about our services in Mississauga.